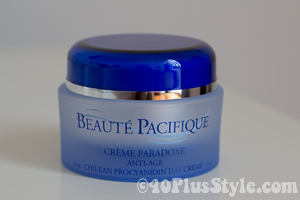 40+ Style » Skin » Can Beaute Pacifique repair your skin? Can Beaute Pacifique repair your skin? Last week I was invited to the launch of Beaute Pacifique products in Singapore. 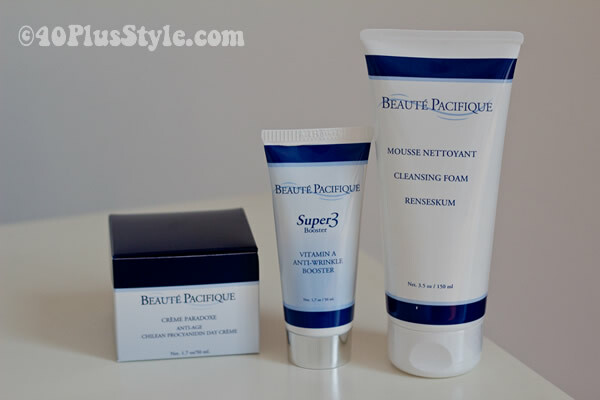 Beaute Pacifque is a Danish brand that specialiszes in producing advanced cosmoceuticals, i.e. cosmetics products with considerable dermatological effects. 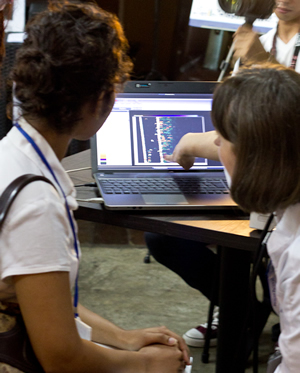 The company actually started off with the production of advanced medical electronic equipment for skin diagnostics. This scanner allows you to see the structure of your skin from the inside. The scanner takes inside pictures of your skin, which allows you to see the overall condition of your skin. You can see how thick your skin is, how much collegen is still left and how much sun damage you have sustained. At 20 the fibers are typically intact. There is a lot of red and yellow indicating the presence of collagen. At 30 you can see that the skin is slightly aged and degenerated. At 40 you can see further aging and degeneration. More dark spots appear which indicate sun damage and there is less collagen. At 50 you see that the fiber is strongly degenerated. The scanner and one of their main physicians from Denmark was actually there, so I was keen to give it a go. The process is very simple. A small scanner just brushes over your skin and takes a picture that is downloaded to the computer. Unfortunately for me the results were not so good. My skin had already aged significantly, my skin was very thin and collagen was almost nowhere to be found. Not good! It did not come as a big surprise as I have known for quite a while that my skin is quite thin and very prone to wrinkles. What I don’t quite understand though, is why I’m aging so rapidly. I eat well, sleep well, do exercise, manage my stress levels, have never smoked and am vigilant with sunscreen protection and staying out of the sun. It may just be bad genes, but that discussion will need to wait for another time..
What can Beaute Pacifique do to help the skin? Question for now: Is there anything that I can do about it? According to Beaute Pacifique, quite a lot. Creme metamorphique and creme Paradoxe can transport active ingredients to the entire depth of the skin which allows the creams to repair sun damage and restore collagen in the skin. Those are big claims, but my information kit comes with several research studies that show significant improvements after applying the creams. As you can imagine, I’m a bit sceptical. I have been using good creams for the last few years and yet my skin results were this bad. But I am happy to put it all to the test. I will use the products for the coming 3 months and will then do another scan to see if my skin has improved. Which products are going to do the magic? Vitamin A anti-wrinkle booster: this cream provides the skin with three forms of vitamin A to rebuild the collagen fibers structures, and help the skin become reinforced and rejuvenated. According to Beaute Pacifque it is currently the most potent anti-age product currently on the consumer market. Benefits include: reduced wrinkles and prevention of the formation of pimples and scars. Creme Paradoxe: this unique cream contains both Resveratrol and Preocyanidin, which have proven to protect the skin’s DNA. It reboots your skin each morning, restores the skin’s integrity and defies aging and sun damage. The cream also provides the skin with three forms of vitamin A esters, which, when combined with the Beaute Pacifique vitamin A cream, will improve the inner structure of the skin. The people from Beaute Pacifique all seem very confident that their creams can reverse a lot of the damage done to your skin. I sure hope they are correct! I will do the skin test again in 3 months and will let you know of the results. If it works, they will have found themselves a new brand ambassador! In the meantime you can go visit the Beautelab website where you can currently purchase some products. Prices range from $41 to $180. Retail locations in Singapore will yet need to be confirmed. How is your experience with anti-aging creams? Have you seen significant improvements after using a cream? Have you ever done a skin scan? And do you know this brand? Update: I had my second scan. For results please see Beaute Pacifique 2nd scan results. I haven’t tried this brand but I have upgraded to a line of anti-aging skin creams and I’ve seen some improvements in my skin. It’s not actually like the wrinkles have vanished altogether but my skin is more radiant and just looks happier. I’m looking forward to seeing how this product works on you! Often I find the claims by cosmetic companies are really just smoke and mirrors. I do wish there was a youth serum though! Good to read that you have seen improvements! I’m very interested in the outcome of this trial. The people from Beaute Pacifique seemed so confident that it will work! I think the interesting part of this skin care line is the scan they do. It will be fascinating to see the difference with the second scan in three months. I do love skin products and most often use Clinique but buy Nars when I can afford it because I do think it makes my complexion look soft and fresh. But I honestly feel the best thing you can do for your skin is to nourish it from the inside out. Eat salmon and tuna, Greek yogurt, blueberries, nuts, red and yellow peppers, and drink lots of Green tea. Exercise in the fresh air (we have 6.5 inches of snow with 3 more expected by morning so the outside part is not easy! ), and get 7 or 8 hours of sleep a night. And laugh every chance you get. Have a grateful heart and enjoy life. Use the creams too but the healthy living will make them work better. I know, I’m very keen to see what the results will be. I agree with you that skincare is a lot about doing all the right things. But I’m doing most of them… Perhaps I’m unlucky in the gene pool and will just need all the help I can get! This is really interesting! I think my skin is in good condition, it’s still quite plump, almost no wrinkles and I’m often told that I look younger than my years, but it would be very interesting to get a scan. I’ve never heard of the brand in question, but it might be quite new? Of all the products I’ve tried, I’ve seen the best results from using the Vespera Bionic Serum from Exuviance and SkinDoctors Relaxaderm, these really make a difference. I also take an Omega 3-supplement and Evening Primrose oil capsules and vitamin B. Yes I’m very curious if there is any difference in the scan in 3 months. You are very lucky to still have such good skin! It’s actually a Danish brand so I would imagine they also have it in Norway. I’ve never heard of the brands you mention, but great to read that they did help! you were in singapore? Welcome to our little island. Haven’t heard of this brand but sounds really good. Please review the products again after you tried them. Thank you for sharing! I live in Singapore! You too? The brand is Danish and brand new in Singapore. They are just launching it.. I have never heard of this brand…I live in the USA. I am 48. Nearly 15 years ago, I had a similar test done and I had quite a bit of deep skin sun damage. I have loyally used suncreen on my face since my 20s. It is really hard to tell if things work well or not because we don’t know how we would look otherwise. I started treating the back of my hands the way I treat my face and I have seen a huge improvement there. My dark spots have lightened and my hands are softer. I do know that when I moisturize, my skin just looks better. I am about to start using Vitamin C concentrate ( antioxidant ) under my sunscreen. I have heard from several doctors that it really makes an enormous difference. Finally, you are right. So much of this is genetic and there is no way that anything topical, at this point, can affect us on a molecular level. I do believe, though, that some of these treatments can protect our skin while giving it more time to repair itself. Thank you for your input. I recently read from another lady that she wished she would have treated her hands as the did her face. As her hands had grown old and her face was in good shape. Good tip about the vitamin C also! It is a very interesting article. Thank you! I am at my (very) late 30’s :p and started using Vitamin C and Vitamin A serum a year ago. I really can see the difference! My skin is more radiant and more even-toned than last time. I don;t have wrinkles on my face but some fine lines around my eye areas. So far I am very happy with the result. BTW, the brand I am using is called Medik8 which is from the UK but I bought it from Australia. Not sure if it is selling in Singapore….any idea? Please let us know if there is any improvement after you have tried Beaute Pacifque. I am very curious….thank you! Thanks for your feedback Chloe. I need to go back to check soon, but will keep you updated. Thanks for the details of your skincare regimen; very interesting. I have never heard of that brand though. So how was it? I need some new skincare but wanted to wait to hear your result before I went this route. Hi Henriette. Thanks for asking. I posted an update a while ago at: https://40plusstyle.com/some-40-news-bites-to-start-the-weekend/ Basically my scan results were much better and I’m still using the vitamin anti wrinkle booster. For more details see the afore mentioned link. Hi, I live in the Faroe Islands (that’s part of Denmark, by the way, even it’s quite far on the map from it) and this product has been in some of the shops here for quite a while. My sister-in-law took me for one of their skin scan and I’ve got some suggestions too, among them the Booster for th night. I can’t afford it at the moment, but I thought giving it a chance, because I saw the second scan of her and it was an obvious improvment. She uses also the Paradoxe cream, now she got some exfoliator and some eye cream too. The brand is quite famous in Denmark and usually Danes come with very high quality products, so I don’t doubt the cosmetics get in the same category. Thanks for the feedback Andrea. Yes, I have been pretty happy with their products too! I’ve used these products for about 5 years now. I love them. My skin looks great, I’m 55 and often get comments that I look 40 (I’ve even been guessed in my mid to late 30’s a few times). I use the Triple 3 at night after I wash my face and wake up with nice Dewey skin plus my breakouts have stopped. I use defy damage during the day and it goes nicely under my makeup – no greasy feel at all. I highly recommend these products and they are so affordable compared to many others out there that contain zero “active” ingredients. Next post: Shapewear: do women (over 40) need it?